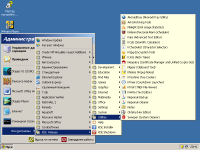 In w2k3, all the start menu links of KDE 4.10.2 apps have normal icons. Each app has his correct icon. In ros, the icons on the links are incorrect. Each link has hard drive icon instead of his app icon. In order to see this, just open start menu, and go to "Programs" -> "KDE Release" and browse all categories with all links and look at three links below. This version of KDE I downloaded and installed via Rapps. The difference is visible on attached screenshots.